What it says on the tin. This is a specimen from the UCMP comparative collection. I was just going to post this photo with zero commentary, but I can’t help myself. 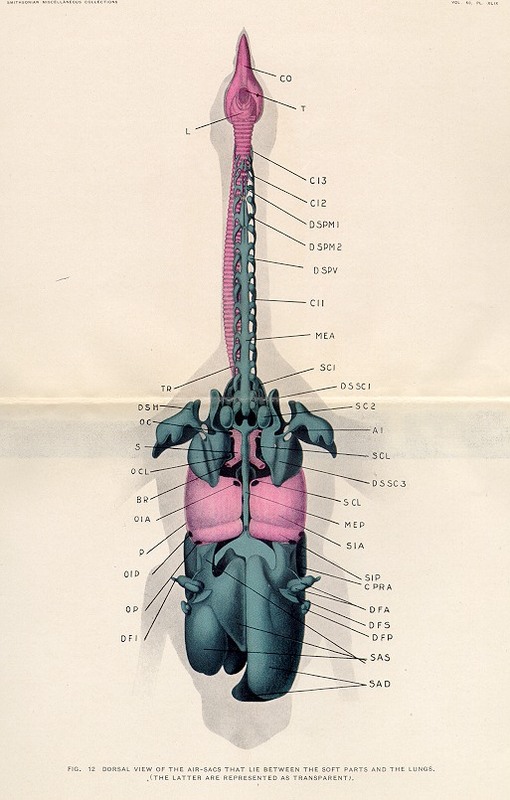 Note that on the two vertebrae in the middle, the crista transverso-obliqua (what in non-avian dinos would be the spinopostzygapophyseal lamina or SPOL) rises higher than either the neural spine apex or the epipophyses. That’s crazy. And it demonstrates something we also see in sauropods, which is that laminae are not merely the plates of bone left behind after pneumatization has scooped all of the unnecessary material out of a normal vertebra–sometimes they are additive structures, too. As long as I’m yapping, note the light shining through the honeycombed internal structure of these highly pneumatic vertebrae. 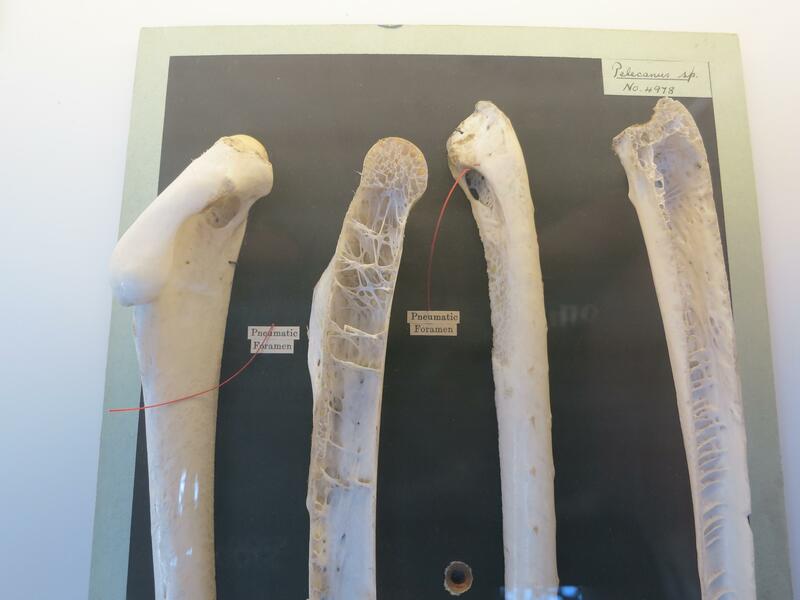 For more on the ridiculous pneumaticity of pelican bones, see this post and this one. 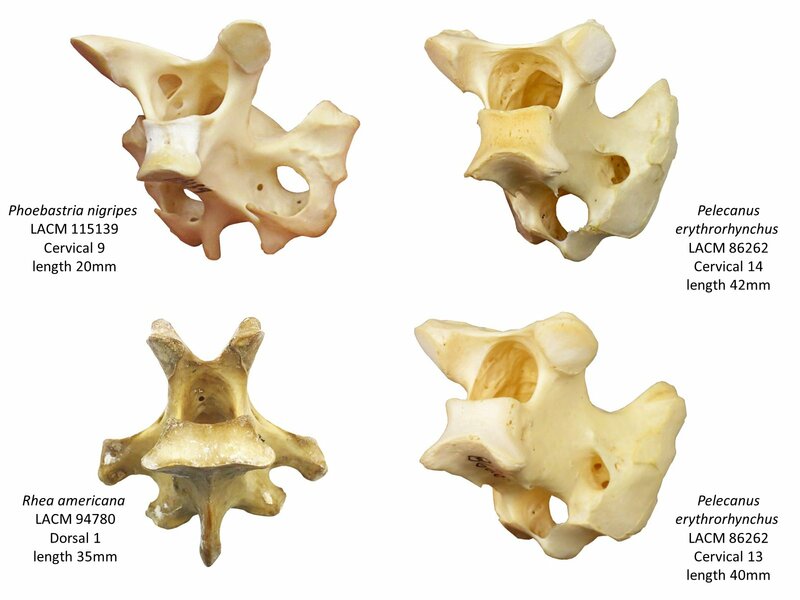 For more on the homology of bird and sauropod vertebrae, see Wedel and Sanders (2002), and for more on laminae as additive versus reductive structures, see the discussion on pages 210-212 of Wedel (2007). Wedel, M.J. 2007a. What pneumaticity tells us about ‘prosauropods’, and vice versa. Special Papers in Palaeontology 77:207-222. Müller (1908: fig. 12). Upper respiratory tract, trachea, and lungs in pink, air sacs and diverticula in blue. DSPM = diverticulum supramedullare. Way back when I was working on my Master’s thesis at the University of Oklahoma and getting into pneumaticity for the first time, Kent Sanders found Müller (1908) and gave me a photocopy. This would have been the spring or summer of 1998, because we used some of Müller’s illustrations in our poster for SVP that year (Wedel and Sanders 1998). Müller’s description of pneumatic diverticula in the pigeon formed part of my intellectual bedrock, and I’ve referenced it a lot in my pneumaticity papers (complete list here). One of the systems that Müller described is the diverticulum supramedullare, a.k.a. supramedullary diverticula, or, informally, supramedullary airways (SMAs). Traditionally these are defined as pneumatic diverticula that enter the neural canal and lie dorsal (supra) to the spinal cord (medulla), although O’Connor (2006) noted that in some cases the diverticula could completely envelop the spinal cord in a tube of air. 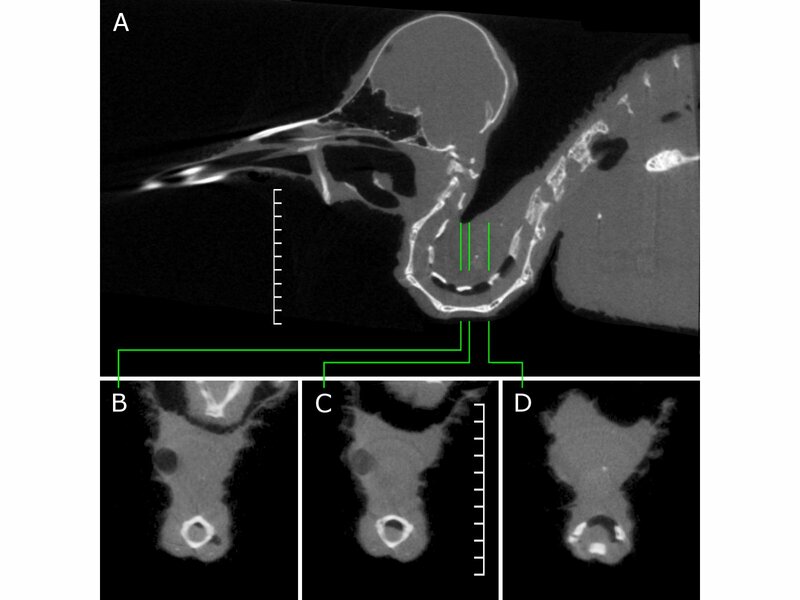 I yapped about SMAs a bit in this post, and they’re flagged in almost every ostrich CT or dissection photo I’ve ever published, here on the blog or in a paper. CT sections of a Giraffatitan cervical, with connections between the neural canal and pneumatic chambers in the spine highlighted in blue. Modified from Schwarz & Fritsch (2004: fig. 4). 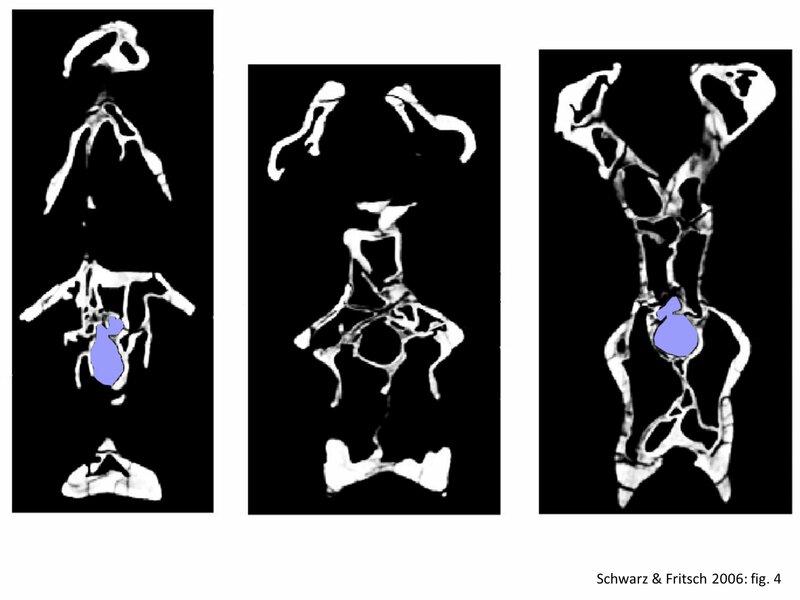 Fast forward to 2006, when Daniela Schwarz and Guido Fritsch documented pneumatic foramina in the roof of the neural canal in cervical vertebrae of Giraffatitan. As far as I know, this was the first published demonstration of SMAs in a non-bird, or in any extinct animal. Lemme repeat that: Daniela Schwarz found these first! OMNH 60718: too ugly for radio. This is an unfused neural arch in ventral view. Anterior is to the left. Neurocentral joint surfaces are drawn over with ladders; pneumatic foramina lie between them. Shortly thereafter I independently found evidence of SMAs in a sauropod, in the form of multiple pneumatic foramina in the roof of the neural canal in an unfused neural arch of a basal titanosauriform (probably a brachiosaurid) from the Cloverly Formation of Montana. It’s a pretty roadkilled specimen and I was busy with other things so I didn’t get around to writing it up, but I didn’t forget about it, either (I rarely forget about stuff like this). Then in 2013 I went to the Perot Museum in Dallas to see the giant Alamosaurus cervical series, and I also visited the off-site research facility where juvenile Alamosaurus from Big Bend is housed. 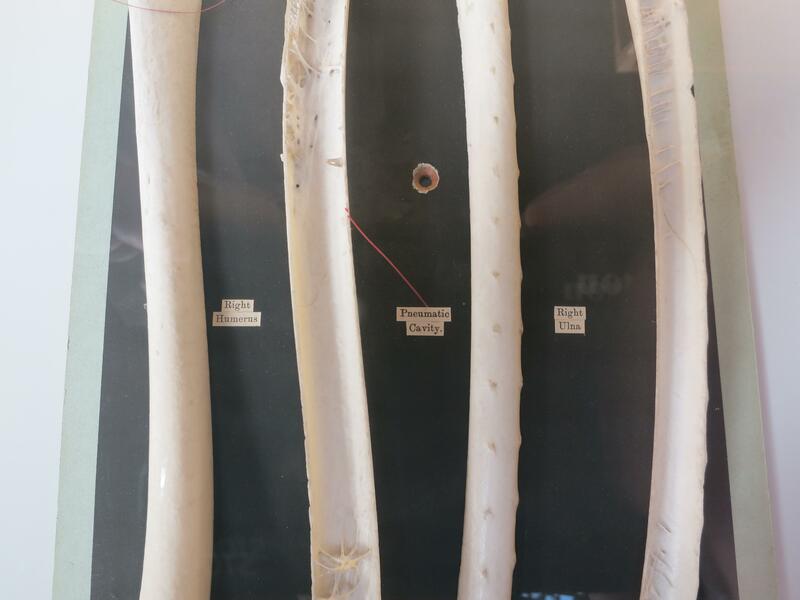 When Ron Tykoski let me into the collections room, I was literally walking through the door for the first time when I exclaimed, “Holy crap!” I had spotted an unfused neural arch of a juvenile Alamosaurus on a shelf across the room, with complex pneumatic sculpting all over the roof of the neural canal. Title slide for the 2014 SVPCA presentation. The Big Bend and Cloverly specimens were the basis for my talk on SMAs at SVPCA in 2014, coauthored with Anthony Fiorillo, Des Maxwell, and Ron Tykoski. As prep for that talk, I visited the ornithology collections at the Natural History Museum of Los Angeles County, photographed a lot of bird vertebrae with foramina inside their neural canals, and shot this pelican video. That was four years ago – why no paper yet? 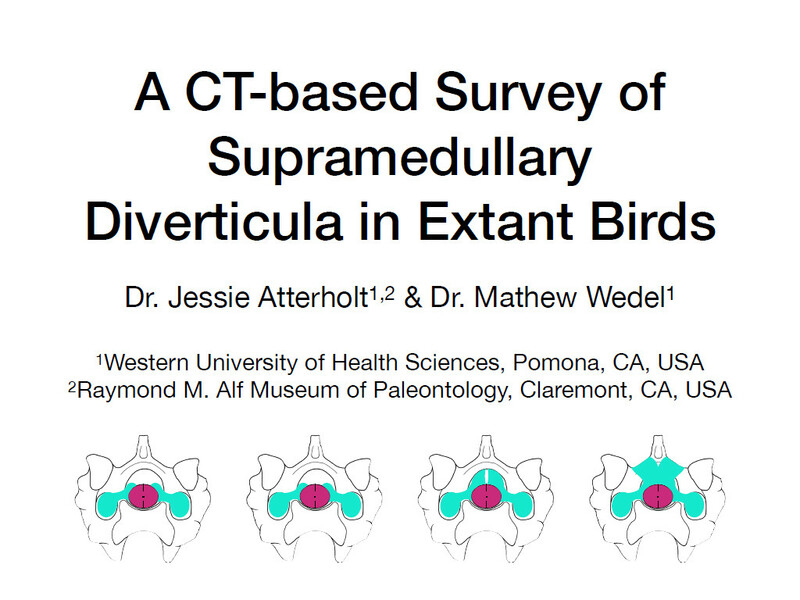 It’s because I wanted one more piece of smoking-gun evidence: a CT scan of a bird that would show a direct communication between the SMAs and the air spaces inside a vertebra, through one or more foramina in the roof, wall, or floor of the neural canal. A spectrum of pneumatic traces in the neural canals of birds, including complexes of large or small foramina, isolated foramina, and sculpting without foramina. In 2017, Jessie Atterholt taught in our summer anatomy course at WesternU as an adjunct (her full-time employment was at the Webb Schools in Claremont, home of the Alf Museum). Jessie and I had been acquainted for a few years, but we’d never had the opportunity to really talk science. As we chatted between dissections, I learned that she had a huge warchest of CT scans of whole birds from her dissertation work at Berkeley (we’d missed each other by a few years). My antennae twitched: one nice thing about SMAs is that, being bounded by bone, they can’t collapse after death, unlike more peripheral diverticula. And air is jet black on CT scans, so SMAs are easy to spot even on comparatively low-res scans. All you need is one or two black pixels. I proposed a collaboration: we could use her CT scans to survey the presence and distribution of SMAs in as many birds as possible. Vertebral diverticula in two sagittally-exploded cervical vertebrae of a turkey. Anterior is to the left, #5 is the SMA. Cover (1953: fig. 2). Yes, I know this is gross – if anyone has a cleaner scan, I’m interested. You might think that such a survey would have been done ages ago, but it’s not the case. A few authors have mentioned supramedullary airways, and O’Connor (2006) gave a good description of some of the variation in SMAs in extant birds as a whole. But the only detailed accounts to illustrate the morphology and extent of the SMAs in a single species are Müller (1908) on the common pigeon and Cover (1953) on the domestic turkey. 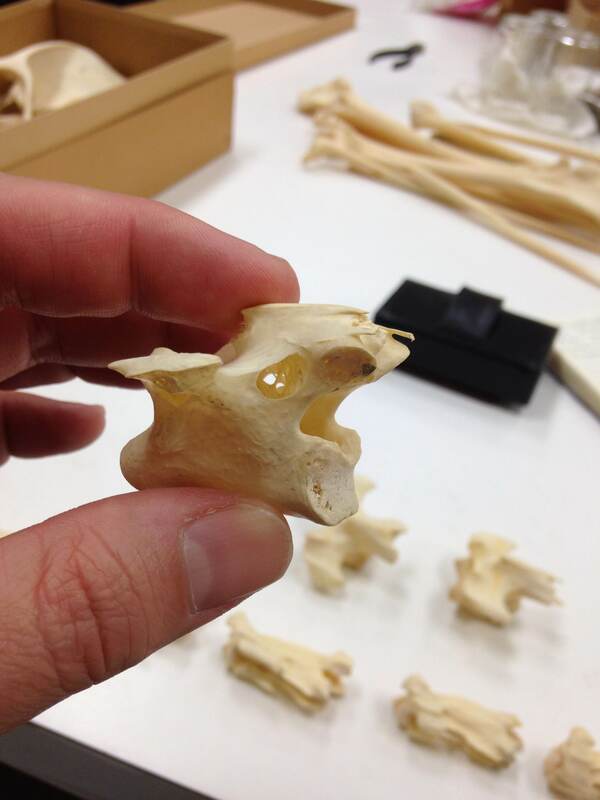 I’d seen what I suspected were traces of SMAs in the vertebrae of many, mostly large-bodied birds, and I’d seen them in CTs of ostriches and hummingbirds, and in ostriches and turkeys in dissection. But Jessie was offering the chance to see both the SMAs and their osteological traces in dozens of species from across the avian tree. SMAs in a micro-CT of a female Anna’s hummingbird, Calypte anna. Scale bars are in mm. Real life intervened: we were both so busy teaching last fall that we didn’t get rolling until just before the holidays. But the project gradually built up steam over the course of 2018. One story that will require more unpacking later: everything I’ve written on this blog about neural canals, Haplocanthosaurus, or CT scanning in 2018 is something serendipitously spun out of the SMA survey with Jessie. Expect a lot more Atterholt and Wedel joints in the near future – and one Atterholt et al. (minus Wedel) even sooner, that is going to be big news. Watch this space. We were bummed for a day, and then Jessie decided that she’d submit the abstract to SVPCA, only slightly chopped for length, and go to Manchester to present if it was accepted – which it was. Unfortunately I’d already made other plans for the fall, so I missed the fun. 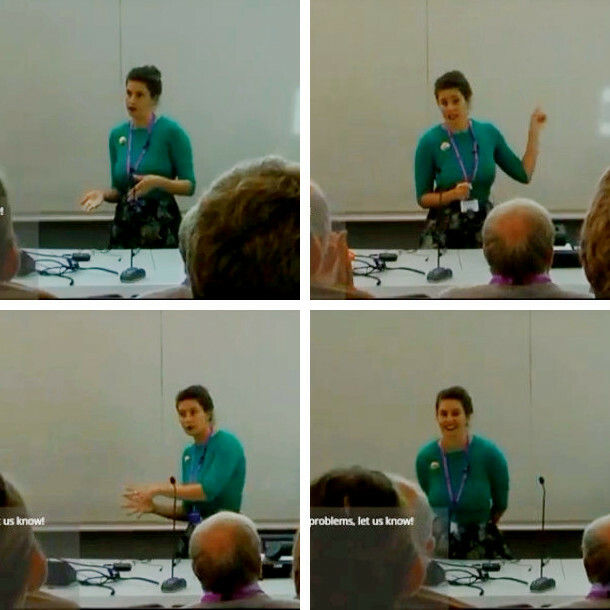 Fortunately the SVPCA talks were livestreamed, so last Friday at 1:30 in the morning I got to watch Jessie give the talk. I wish the talks had been recorded, because she knocked it out of the park. Title slide for the 2018 SVPCA presentation. And now everything we’re in a position to share is freely available at PeerJ. The SVPCA abstract is up as a PeerJ preprint (Atterholt and Wedel 2018), the longer, rejected SVP abstract is up as a supplementary file (because it has a crucial paragraph of results we had to cut to make the length requirement for SVPCA, and because why not), and our slideshow is up now, too. I say ‘our’ slideshow but it’s really Jessie’s – she built it and delivered it with minimal input from me, while I held down the sauropod side of our expanding empire of neural canal projects. She has the paper mostly written, too. Oh, and we did get the smoking-gun images I wanted, of SMAs communicating with pneumatic spaces in the vertebrae via foramina in the neural canal. Often these foramina go up into the neural arch and spine, but in some cases – notably in pelicans and the occasional ratite – they go down into the centrum. So I now have no excuse for not getting back to the sauropod SMA paper (among many other things). We’re making this all available because not only are we not afraid of getting scooped, we’re trying to get the word out. SMAs are phylogenetically widespread in birds and we know they were present in sauropods as well, so we should see some evidence of them in theropods and pterosaurs (because reasons). 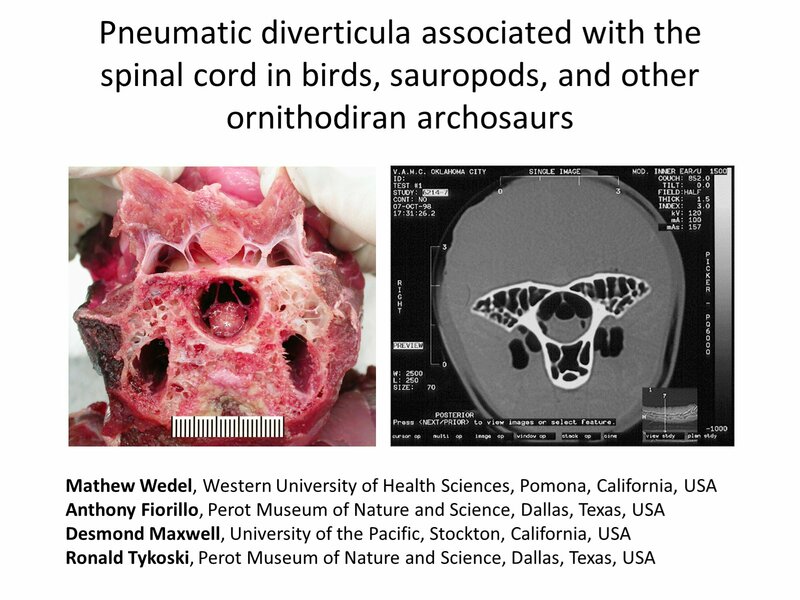 I made such a nuisance of myself at the recent Flugsaurier meeting, talking to everyone who would listen about SMAs, that Dave Hone went and found some pneumatic foramina in the neural canals of Pteranodon vertebrae during the conference – I suspect just to shut me up. That’ll be some kind of Hone-Atterholt-Wedel-and-some-others joint before long, too. Anyway, point is, SMAs are cool, and you now have everything you need to go find them in more critters. Jessie and I are happy to collaborate if you’re interested – if nothing else, we have the background, lit review, and phylogenetic sampling down tight – but we don’t own SMAs, and we’ll be nothing but thrilled when your own reports start rolling in. Unexplored anatomical territory beckons, people. Let’s do this. Cover, M.S. 1953. Gross and microscopic anatomy of the respiratory system of the turkey. III. The air sacs. American Journal of Veterinary Research 14:239-245. Müller, B. 1908. The air-sacs of the pigeon. Smithsonian Miscellaneous Collections 50:365-420. O’Connor, P.M. 2006. 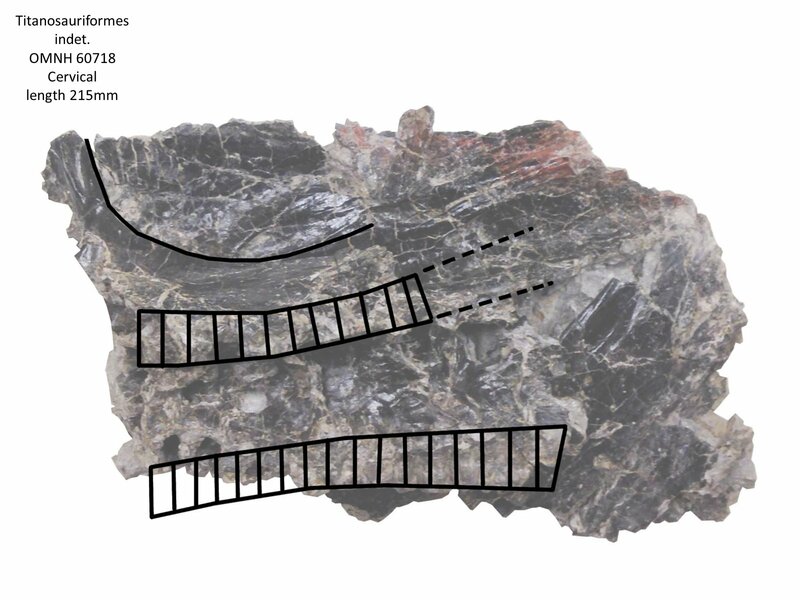 Postcranial pneumaticity: an evaluation of soft-tissue influences on the postcranial skeleton and the reconstruction of pulmonary anatomy in archosaurs. Journal of Morphology 267:1199-1226. Schwarz D, and Fritsch G. 2006. 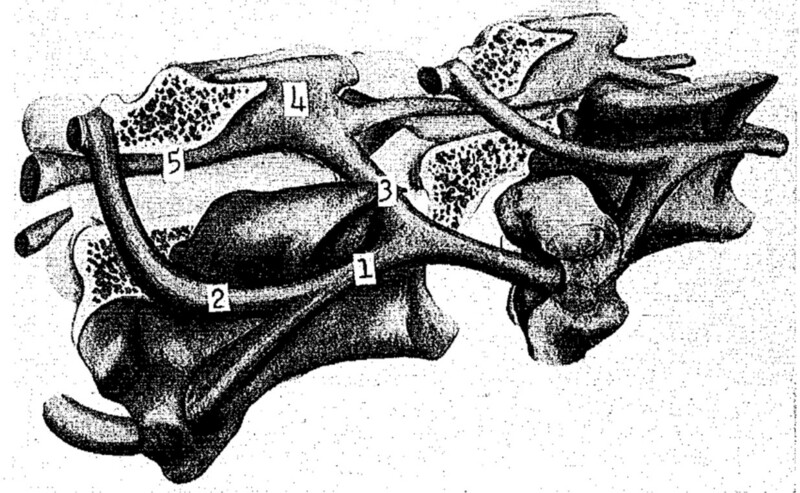 Pneumatic structures in the cervical vertebrae of the Late Jurassic Tendaguru sauropods Brachiosaurus brancai and Dicraeosaurus. Eclogae Geologicae Helvetiae 99:65–78. Wedel, M.J., and Sanders, R.K. 1998. 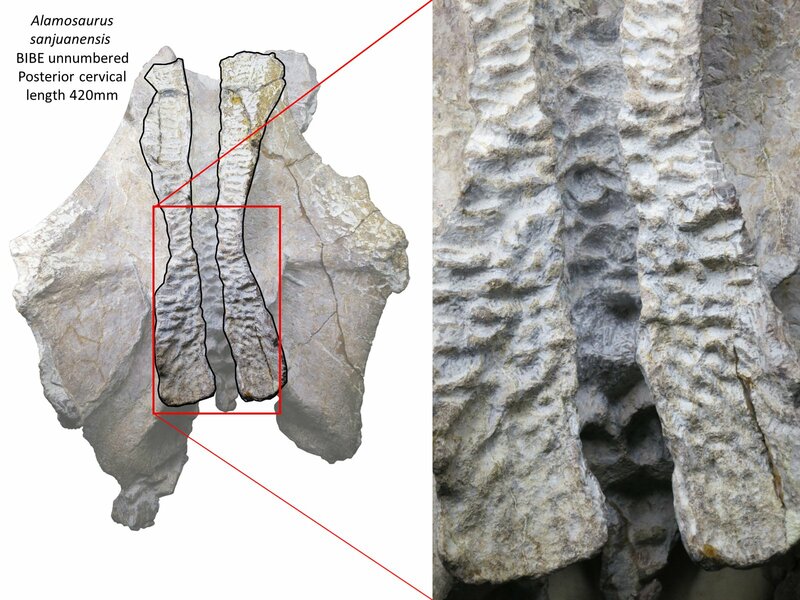 Using computerized tomography to investigate sauropod cervical morphology. Journal of Vertebrate Paleontology 18, Supplement to Issue 3: 87A. 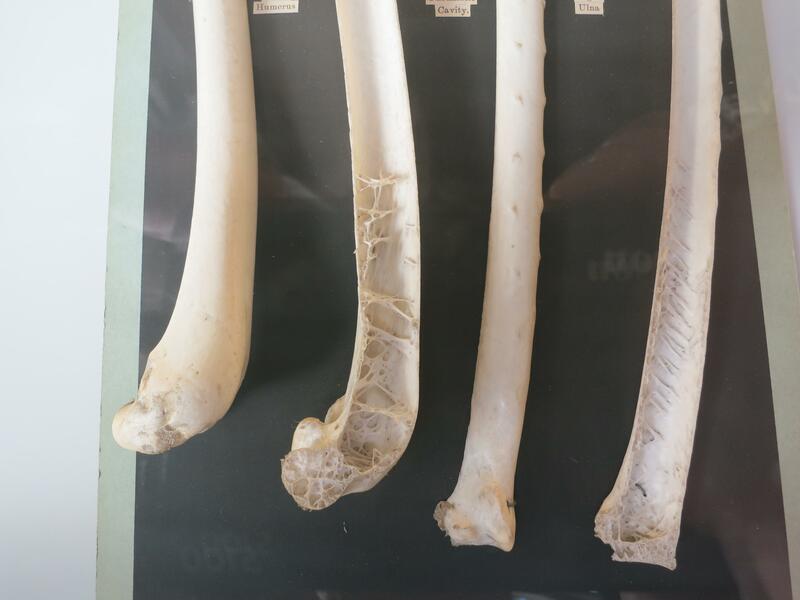 What we’re seeing here is the top third of each bone: humerus halves on the left, ulna halves on the right, in a photo taken at the 2012 SVPCA in one of our favourite museums. 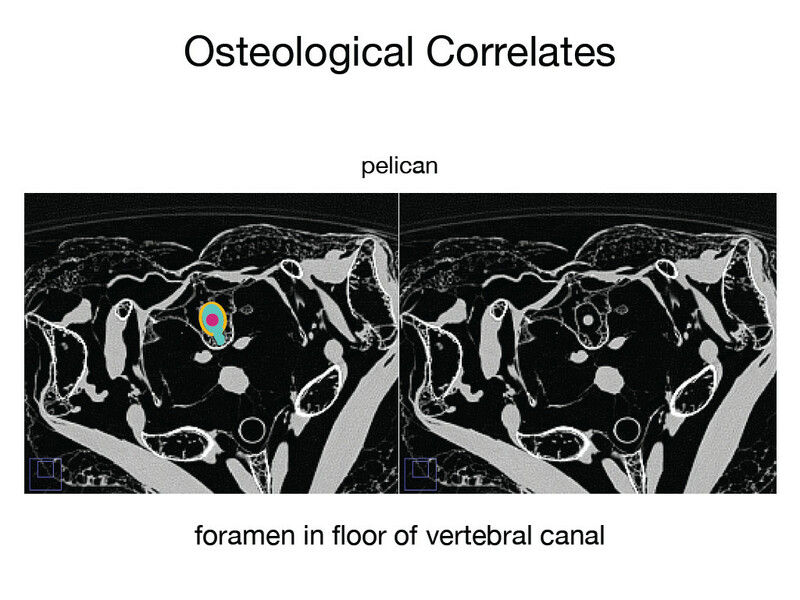 We’ve mentioned before that pelicans are crazy pneumatic, even by the standards of other birds: as Matt said about a pelican vertebra (skip to 58 seconds in the linked video), “the neural spine is sort of a fiction, almost like a tent of bone propped up”. Honestly. 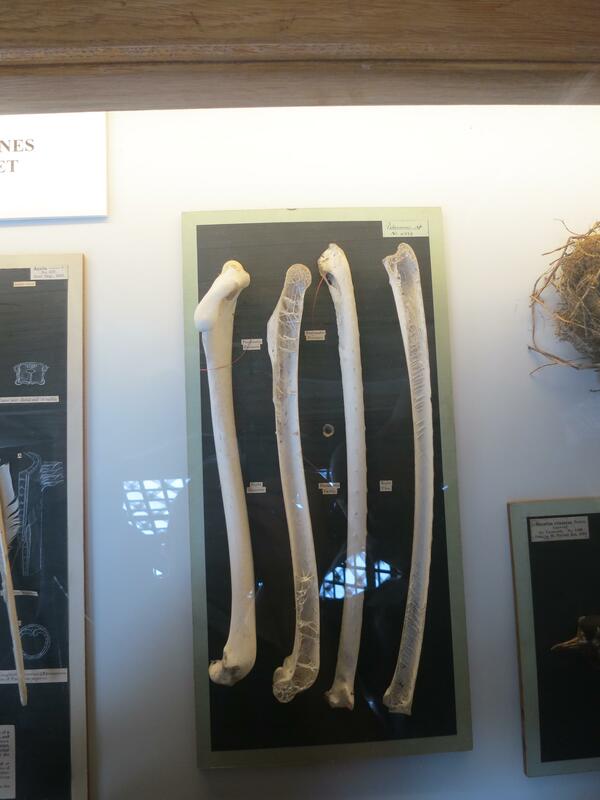 Pelican skeletons hardly even exist. I was at the Natural History Museum of Los Angeles County yesterday to do some research in the ornithology collection. After lunch I was working on this pelican skeleton and I thought, “Geez, there is just no way to do this thing justice with still photos. I should make a video.” Here it is. You’ll want to see it full-screen–this being my first time out making a video, I didn’t realize that I was holding the phone the wrong way for efficient viewing on other devices. The specimen is LACM Ornithology 86262. I’m posting this video with the knowledge and kind permission of the ornithology collection staff. If you like it that stuff like this exists, please support your local natural history museum, especially the LACM, which has some really fantastic education and outreach programs.